The development of new, hard mixed lines seems to happen over time. You can't always look at a line and say "this is going to go today, no question about it". At first the climbing seems impossible. After a few tries though, holds begin to appear and crux sequences become muscle memory. Sometimes, at first, the climbing feels so scary that it's hard to climb, even on a toprope. In the Catskills, everything feels loose even when it's solid. After several good attempts, however, the line often progresses from "impossible" to very doable yet challenging. I like doable yet challenging. Two winters ago Lucho Romero tried many of the newer mixed lines in the upper Hell Hole and enjoyed them. All the while though, he stared at the cliff directly across the narrow gorge. This shadier, steeper loose-looking cliff had more or less been ignored. There is one outstanding established route on it's left end, and that's it. This route, Gomorrah, is one of the Catskills' true ice testpieces. Although short, the face is gently overhanging the entire way. A thin strip of ice, at most 4 inches thick, occasionally forms on this face (I've done it twice in 8 years, one time taking a heart-stopping whipper when a tool placement blew near the thicker ice at the top). 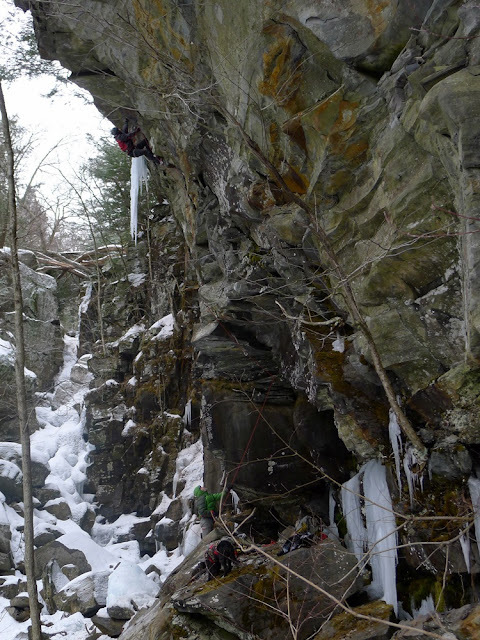 Sodom & Gomorrah, the direct start to the line, has the kind of climbing where if you blow one tool placement in the 1" thick ice at the bottom you might be out of luck. Dare I say this short route is WI6-? No one else talks about the grade but that seems right to me. Bob Otten lead it on gear back in the day (badass). Kevin Delaney retrobolted it and Purgatory without permission. This made bolting things, umm, a wee bit awkward for a long time to come. I digress. Suffice to say this route is really hard, and it's on the least steep part of the cliff. Lucho swore there were more lines on this overlooked little cliff. The rock looked so soft, loose and scary that I ignored him. Last week though, I started paying attention. He'd tried a route there on toprope several times this season, was convinced it was really good and also felt that it could go for the right individuals. 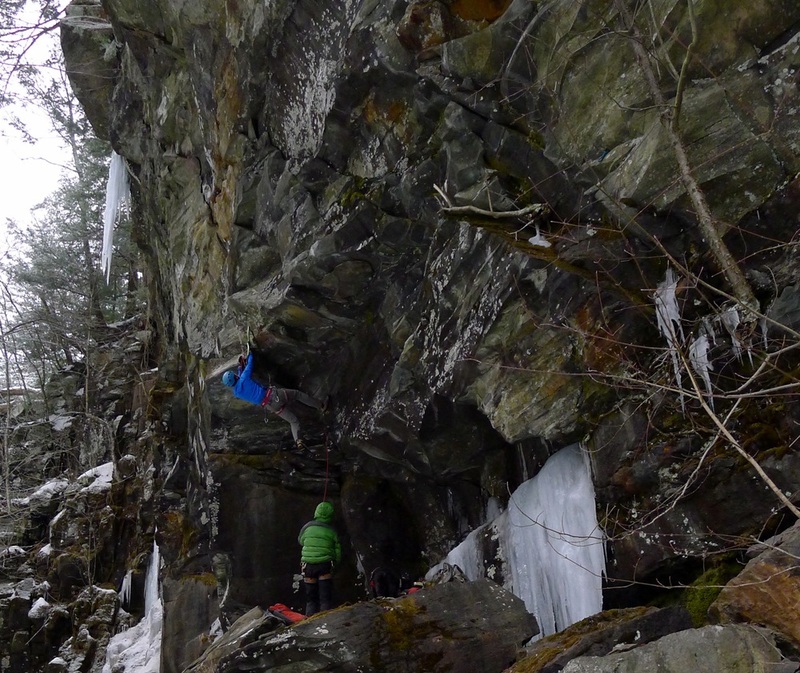 An impossibly hard horizontal roof crux led to overhanging flakes and then an icy corner. During their first effort earlier this winter, four strong climbers all fell off at the roof crux repeatedly before giving up. Lack of a good directional above meant they would take terrifying falls on toprope when they let go. During another session Lucho worked out a less direct start, which kept the climbing in the M8 range. Last Tuesday I met Chris Beauchamp and Pete Guyre at Platte Clove. We immediately headed for Lucho's line. The night before he'd given us the go-ahead to try his project. Chris lowered down and found pieces of gear that worked as directionals. He found a good piece to protect the crux swing too, which would make working the crux easier. In conjunction with a back belay from the ground we were able to work the crux. We set to work trying the line. After a couple of efforts the direct, roof crux felt hard but doable. The remainder of the climb, up hollow sounding sharp-edged flakes was more about pump management than hard cruxes. By this point it was mid-afternoon. We were tired, and the ice at the top was cooking in full 40-degree sun. All of us agreed to return in the morning, when the ice was frozen in place, to give this wild, loose-feeling line a redpoint effort. The following morning, with tender biceps and sore hamstrings all around, we hiked down the hill. After a not-so-warm warmup on Chris' new mixed moderate The Road of Good Intention, M6-, we began our effort in earnest. Keeping our order from the previous day, I set off first. I climbed quickly through the crux, avoiding unnecessary moves. As I was reaching for the only rest stance on the route one of my tools skated off a sloped hold overhead. The other one held; I was still on. I caught my breath at the rest and charged into the overhanging barehanded juggy flakes. As I reached the icy corner my legs were trembling. I scummed my left hip in the corner and breathed a sigh of relief. A few minutes later I clipped the anchors, elated about not having to put forth that same effort again. By the end of the day, after several impressive attempts, Pete styled the route to the ice. His last redpoint attempt came to a heartbreaking end as the rotten ice broke beneath both of his tools simultaneously. On Sunday, both Chris and Pete also redpointed the line. Despite looking loose, the route has fantastic climbing. The M9-(?) 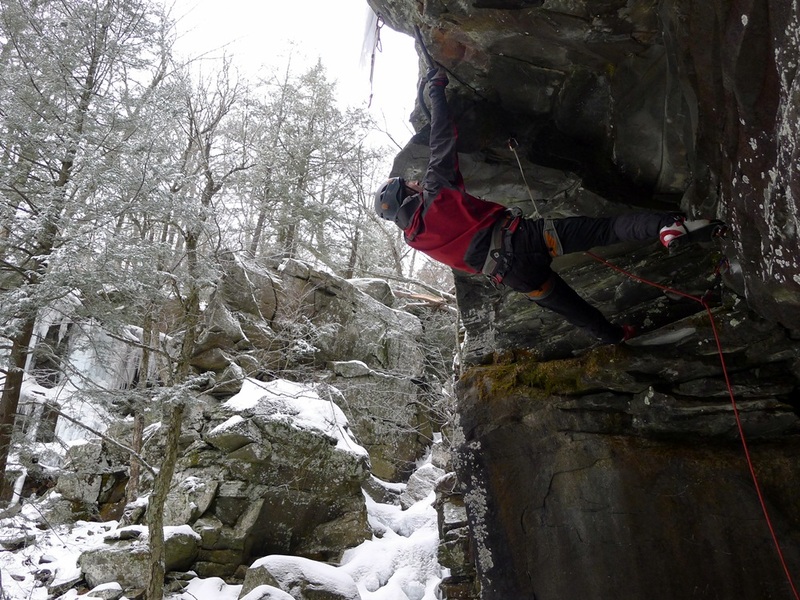 crux is followed by overhanging rock climbing on big flakes and finishes with an M7/8 crux to gain the icy corner above. It's a sprint to the finish with some very hard moves on small holds at the start. We've decided to stick with the "Hell" theme and want to call this one Loosifer. 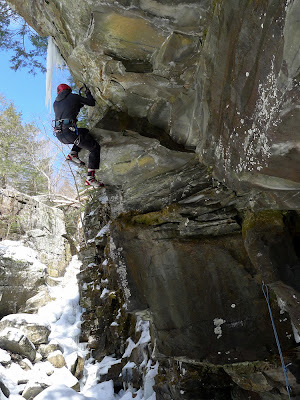 This route is probably the hardest mixed line in the Catskills right now (where Hydropower is sustained, this route has a punchy, hard crux), and with such fun climbing it might be my favorite line in the Hell Hole. Here is the link to the full album of images from the day. Thanks to Chris Beauchamp for the images. He shot most of them with my camera, as it was the only day I've ever seen him without his camera gear.